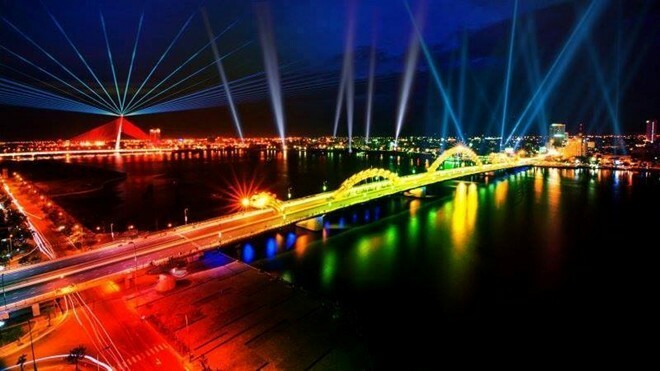 The Da Nang International Light Festival (DILF) 2015 will be held from September 4th-6th, reported the provincial People’s Committee in a recent press conference. This is the first time the event will be held in Viet Nam with Da Nang being the host, under the advisory of Malaysia’s Global 2000 Company, organizer of Da Nang International Firework Competition. As scheduled, DILF 2015 will take place on Bach Dang Street stretching from Dragon Bridge to the Han River port area. The Novotel Hotel will be the main staging area for the event. Buildings, the Han River, and building sites in the area will become huge backgrounds for light artists to show off their unique skills, along with amazing sound effects. The main content of the event will include light areas, Video Mapping, light art presentations, LED decoration, music and light performances, interactive light art and street light performances, and electronic music. During the three-day festival, all vehicles will be banned on Bach Dang Street. On the sidelines, DILF 2015 will include an array of cultural and sporting activities such as a firework display on the Han River, street art performances, art exchanges and a gala dinner. Earlier, the festival was scheduled to be held from April 24-26th with the participation of many countries. However, for various reasons, the Da Nang People’s Committee decided to postpone the festival until early September to mark the 70th anniversary of Viet Nam’s National Day (September 2nd).